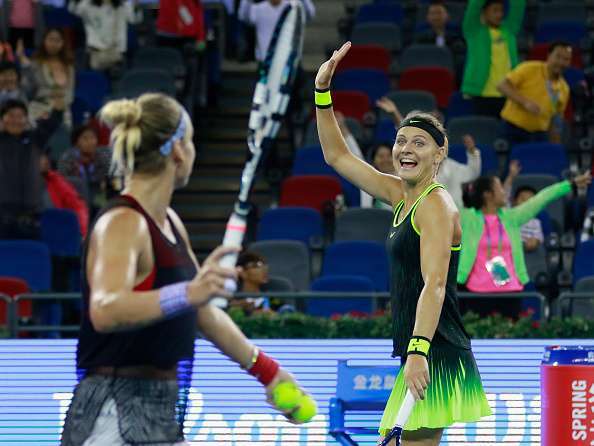 US Open champions Bethanie Mattek-Sands and Lucie Safarova came up with a commanding display to deny third seeds Sania Mirza and Barbora Strycova the title at the Wuhan Open in China on Saturday. The fifth seeds breezed through the final match for a 6-1, 6-4 win. This was their third title of the season after triumphing at the Flushing Meadows and the Miami Open. Since joining forces in August, Mirza and Strycova met with success immediately. This was their third final in four tournaments together. The only time that they lost before the final was at the US Open where they succumbed to the top seeds and eventual runners-up Caroline Garcia and Kristina Mladenovic in the quarter-finals. The Indo-Czech duo had arrived in Wuhan after capturing the Pan Pacific Open title in Tokyo last week. And they continued their brilliant run, building up an eight-match winning streak. By reaching the Wuhan final, they even climbed up to the 11th spot on the Road to Singapore Leaderboard that will determine the top eight teams who will get to play at the WTA Finals this month. Mirza, who has already qualified once with former partner Martina Hingis, thus consolidated her position to have another chance at qualifying with a different partner. But despite the confidence-boosting performances the last few days, they came up short against the reigning US Open champions. The first set was totally a one-way traffic where the third seeds were completely outplayed. Mirza and Strycova were broken in the very first game of the match and the trend continued from thereon. Mirza and Strycova had their chances, though. They were presented with as any as six break point opportunities but the third seeds failed to capitalize on any of them. Mattek-Sands and Safarova broke them thrice to take the first set 6-1. The Czech-American pair was in total control of the proceedings even in the second set and made a bright start to go up 2-0. They extended their lead to 4-1 as Mirza and Strycova struggled mightily on their serves. However, towards the very end, the third seeds fought back. By breaking back twice, they put themselves back on serve only to find themselves trailing on their serve at 4-5. Mattek-Sands and Safarova broke them to love to take the title in 1 hour 1 minute.